1. Combine salt, molasses, cloves, and boiling water in a large container. Stir until molasses and salt are dissolved; let cool to room temperature. 2. Pour cold water into molasses mixture; stir to combine. 3. Completely submerge pork chops in molasses mixture. Cover container and refrigerate for 6 hours. 4. Remove pork chops from brine and pat dry with paper towels. Lightly oil each chop. 5. Preheat an outdoor grill for medium-high heat and lightly oil the grate. 6. 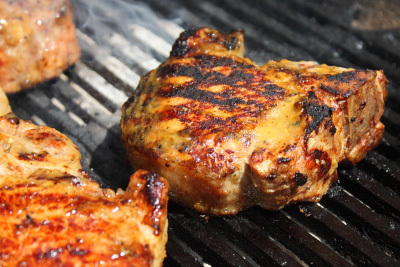 Place pork chops on the hottest part of the grill; cook each side until browned, 2 to 3 minutes. Transfer to a medium-high area of the grill and cook pork until it is slightly pink in the center, 6 to 8 minutes per side. An instant-read thermometer inserted into the center of the chop should read 145 degrees F (63 degrees C).